A US citizen has been convicted of plotting to kill President George W Bush and being a member of al-Qaeda. Ahmed Omar Abu Ali, 24, faces a possible life sentence after a US jury found him guilty on nine counts, including conspiracy to hijack a plane. 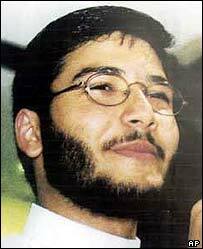 The Arab-American student was held in Saudi Arabia in 2003 and reportedly confessed to membership of al-Qaeda. His defence team said he was tortured and forced to confess, but the judge refused to disallow the confession. Meanwhile, another American, Jose Padilla, has been charged with terror offences more than three years after being seized. Mr Padilla was one of only two US citizens being held as an enemy combatant after being arrested in May 2002. He was originally suspected of plotting to explode a "dirty bomb" but was charged with other terror-related offences on Tuesday. His case had become a battleground between the US government and civil libertarians over how far the authorities could go in holding Americans without charge. The jury in the Abu Ali case deliberated for more than two days before giving its verdict, which the defence vowed to appeal. Abu Ali will be sentenced in February. Abu Ali was held in Saudi Arabia until February 2005, when he was returned to the US and charged on nine counts. Prosecutors alleged that he aimed to establish an al-Qaeda cell similar to the one that carried out the 9/11 attacks. According to charges, it was proposed that Abu Ali would shoot Mr Bush on the street or detonate a car bomb. Abu Ali was born in Houston and raised in Falls Church, Virginia. Prosecutors said that he made contact with al-Qaeda while studying at university in Medina, Saudi Arabia, in 2001. Outlining the charges in February, prosecutor Paul McNulty said Abu Ali had "turned his back on the US and joined the cause of al-Qaeda". "Obviously the jury has spoken but the fight is not over," defence lawyer Khurrum Wahid said outside the federal court in Alexandria, Virginia. "We intend to use the justice system to prove our client's innocence."